Mark2Cure First Beta Experiment is Complete! Thank you! Over the weekend, Mark2Curators completed our first Mark2Cure beta experiment. 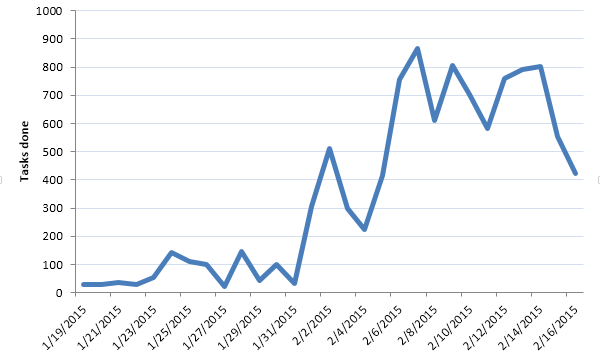 In total, 212 volunteers submitted 10,345 document annotations in just over 4 weeks. Our community ended on a high note, with almost half of the effort contributed in the final week! This weekend’s high was on Valentines day, when Mark2Curators showed their love for science! Thank you to everyone who contributed! The entire Mark2Cure team is extremely grateful for your efforts. Our volunteers were really enthusiastic about helping us improve (sending us over 250 emails with comments, questions, and a lot of useful suggestions), and about helping us get the word out (generating interesting hashtags and tweeting about us persistently throughout the experiment). We also want to send a special shout out to AJ & Judy, an amazing husband and wife team who were both in the top 15 contributors. AJ is a retired engineer. He spends time as a volunteer golf rules official, golfer, and amateur astronomer. Judy is a retired professor, an RN, a hospice volunteer, and is curious about a variety of things. In terms of improvement suggestions and bug report emails, they were number one! We have a secret to confess. All those documents that you just helped to annotate? We already knew the “right” answers. That’s right, professional Ph.D.-level scientists that are trained to do this task (“biocuration”) had already processed these articles. We’re really sorry for misleading you, but it was important for the experiment. So why were we asking you to repeat that work? In short, we needed to prove (to ourselves and other researchers) that Citizen Scientists can do hard tasks in biocuration. And you all stepped up. Your amazing performance can best be summarized by this figure, which shows that, in aggregate, your responses are on par with professional, Ph.D.-level biocurators. 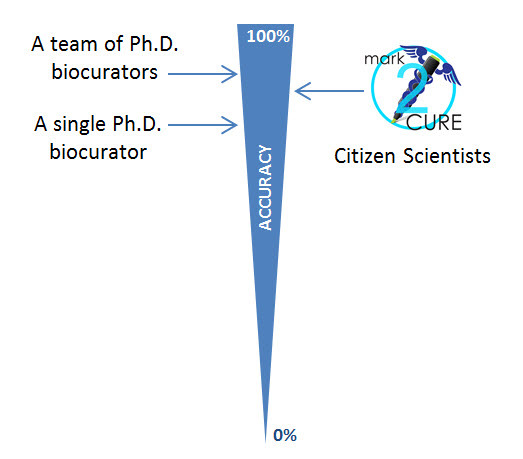 The Mark2Cure community is right on par with professional biocurators in accuracy! You’ve done an excellent job in demonstrating that volunteers are not only willing to contribute to science in this fashion, but can also contribute well. This was our first and final proof-of-concept experiment — from here on out, we’re going to be charting new waters with Mark2Cure. Our goal moving forward is to push the boundaries of Citizen Science, biocuration and disease research. As we hinted previously, our first partner will be the NGLY1 Foundation, led by the amazing and tireless team of Matthew and Cristina Might. The NGLY1 community has been such active partners in designing and promoting Mark2Cure, they were a natural partner. We are currently putting together our next Mark2Cure project focused on understanding NGLY1 biology. The basic task will be the same — highlight concepts that appear in abstracts of research articles. But we’re going to ask your brain to work even harder — more concept types (not just diseases) and many more articles. The overall goal is to contribute to the research that will lead to treatments for NGLY1 deficiency. It’s these potential treatments that the Might family and the NGLY1 community are so desperately seeking, and we believe that the large-scale biocuration done by Citizen Scientists will help lead us there. After NGLY1, we’re going to be expanding to other disease areas as well. Among Mark2Cure participants, we’ve heard from people who are passionate about finding cures and treatments for cystic fibrosis, Hashimoto’s disease, Gaucher disease, Ehlers-Danlos syndrome, Type 1 diabetes, and others. Our vision is to have a Mark2Cure portal for every disease community, but to get there, we need your help. If you haven’t already, please sign up for our email list from the Mark2Cure home page. That will let us notify you right when the next campaign starts, because building early momentum is so critical for success. Help us spread the word. Forward this blog post to family and friends, follow the Mark2Cure twitter account, and like our Facebook page. Volunteer to help make Mark2Cure a reality! Several people have emailed us to volunteer their time and skills to build Mark2Cure. If you have experience in coding, design, marketing, or anything else you think is relevant, please get in touch! We are incredibly energized, and we can’t wait to embark on the next phase of Mark2Cure with you!